The 4-foot Wall Series option is our largest stand-alone Wall Series option, perfect for collectors who have ample space and plenty of wine bottles to show off. Each section holds one full case of your favorite wines. It might be time to join a new wine club. As with our entire Wall Series offerings, these racks are stackable, allowing multiple configurations for wine room projects. 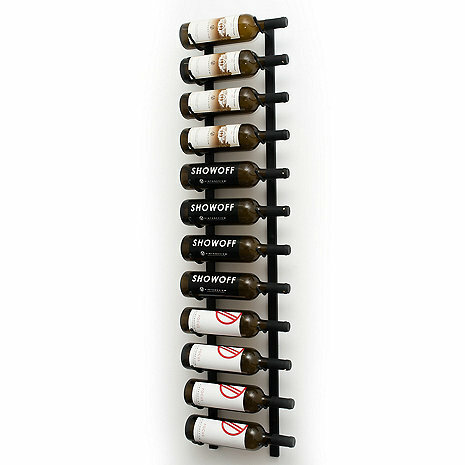 VintageView wine racks' innovative design allows you to display the labels on your wine bottles while maintaining a proper storage position. These wine racks also provide better airflow than virtually any other racking system, making them ideal for long-term storage and display of your favorite wines. The competitive per-bottle cost and ease of installation with VintageView wine racks means they are a superior alternative to traditional cork-forward racking. This one bottle deep, 12 bottle VintageView rack allows you store wine in many areas that wood racking simply cannot accomodate. Available in 4 finishes. how much space is needed between racks? BEST ANSWER: I will start with the fact that I only have one rack. After doing some measuring, I would say 6" would be comfortable. that would accommodate the longer neck bottles. I love this rack and we receive many compliments. We have 3 sets of racks together on a wall and there is 4.25" between each set of racks. Looks good and bottles fit perfectly. What is the total width of two wine racks with 4.25" spacing? Our Vintage View racks can be spaced out in any dimension. Standard spacing is 13" as a bottle is roughly 12" in length. 4.5 inches between each wall mount and 8 inches between each wall mount in the set. How do you install this? Do you need to go through studs in wall? BEST ANSWER: We live in a building built in 1922 and have original plaster walls, so hanging this wine rack was tricky. We ended up adhering a large piece of wood to the wall with 'glue' and molly bolts. Then we hung the rack on the wood panel. If I had drywall, I would definitely hang using studs. The item did come with sturdy metal Sheetrock anchors but I would recommend studs if you can. I have 4 of them hung on a plaster wall and I find them very stout and a great product. Highly recommended. The VintageView racks come with the needed hardware for standard anchoring. This doesn't need to attach to a stud for support. Hi David, how can the wall take the weight if not attached to the studs?? No. The Vintage View Racks come with sheet-rock anchors so you do not have to go through a stud. If you are able to, it would be recommended. Located in southern California so I have some concern about shaking from mild earthquakes. Can anyone comment on how they would rate this product design with regard to minor shakes? No expectations that this product would protect against the "big one". 1 Base Strip 4 Spiral Drywall Anchors, 1 Neck Strip 6 Screws, 6 Mounting Hole Caps, 2 Toggle Bolts and 2 Plastic Couplers. While no guarantees can be made about how an earthquake might affect your wine, this wine rack is well secured to your wall as long as you follow the instructions. We have it on a wall that gets rattled every time the front door slams. No issues there. You could put a backstop behind the bottom of the bottle to keep it from slipping out backwards. could you please advise the total cost including shipping to 106-1634 Harvey Ave Kelowna BC V1Y 6G2 for 8 of the item Number: 624 12 01 ? Do you send to Australia? What are the dimensions of this rack? The wine rack is great. Sturdy, attractive, takes up little space. My only comment is to suggest that you NOT go with the molly or toggle bolts that they recommend. After a couple false tries, we ended up being successful with hollow wall anchors. Other than that, very pleased with the wine rack. Nice way to store wine! This was a perfect way to store our wine in a game room that has no storage space. We stacked one on top of the other and created two rows 8' tall to store 4 cases of wine! This is a great way to display your special labeled bottles in your wine cellar. Row after row, this covers the wall space in an organized way. These are well made pieces. Bought as a Christmas present for my husbands wine collection. He installed with ease and cheered aloud re: the clear, concise instructions & measurement guidelines. This product is outstanding and very affordable. It provides a nice way to store bottles of wine without being too much in a small space. It is easy to install and looks great. Put this wine rack in my kitchen. Looks great and is a practical use of space. Exactly what I was looking for. Good quality and not too hard to install if you follow the instructions carefully. Well made and attractive. They were very easy to install and showcases my wine perfectly. A great addition to our new home. Would definitely purchase again. Really like the look,and keeps the bottles off your counter. Good capacity (12). We put these on the wall of our pantry (large closet type) and it looks great. We can see what wine have, instead of having them in boxes or on shelves. We needed something that would hold many bottles and not take up much spa even-these racks fit the bill perfectly! Really like the wall rack! Highly recommend this product. Package was delivered quickly, damage free and easy to install. I do like the look and quality of the wine racks. The only complaint I have is that it doesn't fit most champagne or pinot bottles.